Are you making best use of your drone? Drones are becoming increasingly popular in the agricultural industry and with the constantly developing technology it can be hard to keep up. To help farmers stay abreast of the changes, and see what benefits drones can yield, Cereals 2018 will feature a range of different exhibitors and live flights in the Drone Zone. “Drones are a good few seasons old now, but not many are using them effectively,” says Jack Wrangham at Drone AG. “We find a lot of farmers and agronomists have bought a drone, or know someone that has, but they are just using them to take normal photos, or a bit of video. They think it’s cool but don’t really see any great use.” The firm will therefore be using the Cereals Event to offer training to make sure farmers are getting the most from their drone. “Drone technology is becoming more automated and easier to use,” he adds. Although the regulation is taking some time to catch up, Drone AG is developing a drone-based spraying system in the UK which is only one or two years away. “Drones are of limited value if the data collected in the air cannot be translated into an insight for a grower,” says Toby Potter, sales director at PrecisionHawk. “To harness the decision-making power of drone technology, an end user needs to have tools that work in unison to collect, process, store and analyse aerial data.” The firm will be demonstrating how the pieces of software work together at Cereals, and the output that should be expected. There are many ways in which drones can be used to benefit farmers and agronomists alike. Auster Aviation is demonstrating the use of Normalised Difference Drought Index (NDDI) technology for imaging in precision agriculture and monitoring crop health. This provides the farmer or agronomist with a prescription map which can be used for applying variable rate fertiliser, thereby reducing nutrient loss and boosting efficiencies. So what does the future hold for drone technology and use? According to Tom Willcock, founder of Auster Aviation, the future is hugely exciting. He sees the development of autonomous drones designed to fly out into the field and send a report to the farmer before they’ve even left the farm house. However, Mr Garbutt reckons the technology will become more in-house, with farmers piloting their own drones and sending the resulting data sets straight to their agronomist. One of the newest bits of kit to look out for at Cereals is Crop Angel’s new DJI Agras MG 1S – believed to be the only one in the country. Primarily used for precision spraying it has accuracy down to one centimetre and is fully customisable for individual needs and environments. Harper Adams University will be focussing on the application of unmanned aerial systems (UASs) in agriculture, through it UAS Special Interest group. 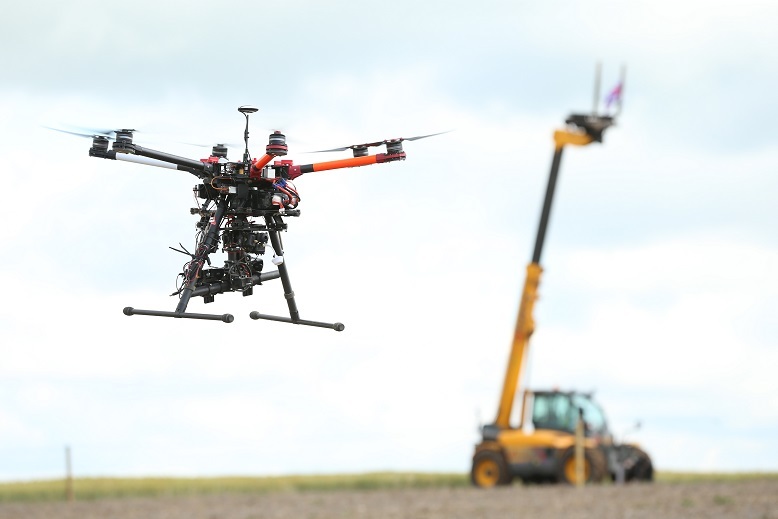 The premise of the group is to develop operational standards and training for drones in agriculture, with close links to the Civil Aviation Authority and Royal Air Force. BASIS will be promoting its agri-awareness UAS qualification, which provides drone pilots with knowledge of drone data collection for agricultural use as well as a safe code of practice. One farmer who has certainly found the benefits of owning a drone is David Knott, farm manager at Trumpington Estate, near Cambridge. He uses his drone for a variety of practical reasons which save time and increase productivity, from assisting with stewardship and mapping variable rates to monitoring hare coursing and land drainage. Also useful for crop walking, he can cover large areas quickly and effectively, much quicker and easier than on foot.